The holidays are all about giving. But instead of handing out neatly-wrapped presents with shiny bows, the Michael Aymar Foundation gifted something life-changing this season: a $5,000 scholarship. The Michael Aymar Foundation is a non-profit organization that honors Mr. Michael Aymar, a former English teacher who taught at Catholic schools across New Jersey. Mr. Aymar believed it was his life’s mission to deliver quality education to his students and ignite in them a level of curiosity that would endure long after they left his classes. Throughout his career, Mr. Aymar built confidence in shy students and added touches of humor and magic to what otherwise could have been mundane lectures. He was known for his seemingly infinite knowledge, mutual respect for his students, and nonstop smile. This is the second year the Michael Aymar Foundation has awarded the NASHDO scholorship. Mia Aymar-Smith – Treasurer of MAF, Mr. John Cohrs – Principal of Aquinas Academy, Mesgana, her mom Helen and her dad Samson. Since Mr. Aymar’s passing, the foundation has provided “financial and instructional support for Catholic school students in grades 5-8.” Its resources include the NASHDO Scholarship, language arts tutoring, educational workshops, and forensics grants. The Michael Aymar Foundation aims to preserve the legacy of the beloved teacher and wordsmith of the same name. The NASHDO Scholarship, awarded in December, derives its name from one of Mr. Aymar’s most memorable grammar lessons: “Not All Sentences Have Direct Objects.” The NASHDO (or “Not All Students Have Decent Options”) Scholarship gives emergency financial assistance to qualified middle school students whose families have just undergone a catastrophic event, such as illness, death, or job loss. $15,000 in three scholarships have been awarded to date by the foundation which was only launched in April of 2016. Through NASHDO, Mr. Aymar continues to help outstanding students through tough times. This winter, the Michael Aymar Foundation awarded Mesgana, a 7th grade student at Aquinas Academy in Livingston, a $5,000 NASHDO Scholarship. Mesgana had attended the Foundation’s Raise the Grade workshops at the West Orange Public Library, where the organization learned of her family’s needs and struggles. 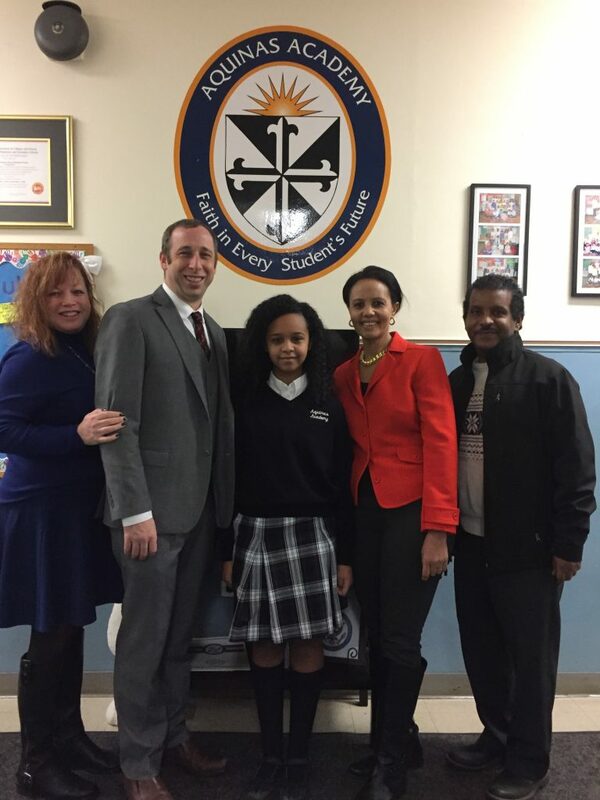 The foundation understood Mesgana’s parents’ commitment to her education and admired the student’s communication skills and “desire to aspire.” They quickly connected with Aquinas Academy to award Mesgana the scholarship money that will allow her family to continue to support her education. The Michael Aymar Foundation is sure that Mesgana will make a wonderful Ambassador, and looks forward to introducing her at the Foundation’s upcoming fundraising event at the Van Vleck Mansion on April 22, 2018. If you would like to join Pilar Kennedy and many others in supporting the Michael Aymar Foundation you can make a donation online at their website or by mailing in your donations to: Michael Aymar Foundation at 16 Helen Avenue, West Orange, NJ 07052. The Montclair Dispatch is thankfully supported by subscribers and advertisers. Please join us.